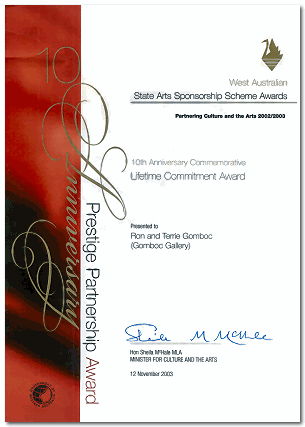 Gomboc Gallery is the largest privately owned Art Gallery in Western Australia. Situated just thirty minutes from the heart of Perth, in the wine growing district of the Swan Valley. 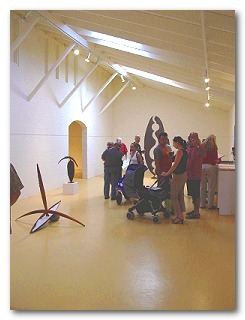 The Gallery was established in 1982 on 4.5 hectares, which is at present being developed into a Sculpture Park. The Gallery's policy is to provide an exhibition venue for established and emerging West Australian artists of all disciplines and to give extra encouragement and assistance to sculptors by way of the on-site bronze art foundry. A new major exhibition is mounted each month, featuring the works of an individual artist or group of artists and the extensive stock display is regularly revised. The Gallery endeavours to cover the full spectrum of artistic tastes and philosophies thereby providing a stimulating display of diverse Australian Fine Art. In November 2003, Ron and Terrie Gomboc were awarded The 10th Anniversary Commemorative Lifetime Commitment Award by Hon. Sheila McHale MLA, Minister For Culture and the Arts. 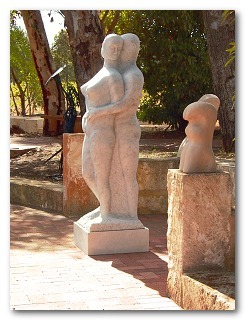 In Western Australia the name Gomboc is synonymous with sculpture and it is a great tribute to the tenacity of both Ron and Terrie that their twentieth annual Sculpture Survey took place in 2003. The survey has a fascinating history which reflects the growth and development of plastic art in this state as well as the vicissitudes of funding and patronage over the past two decades. The highs that we have experienced are essentially due to Ron’s generosity, leadership, vision and persistence. It is largely with his own hands that he has created a superb venue uniquely suited to this event – incorporating the multifaceted facilities of a formal gallery, extensive outdoor gardens, a foundry and residential studio space. Twentieth Annual Exhibition - Sculpture Survey 03 was the crowning and most public achievement of the Gallery’s annual program. It had an evangelical role that transcended the routine commitments and necessarily commercially driven calendar of monthly presentations and aimed to embrace a wider participation from both professionals and the public than was usually possible. By displaying a wide variety of different styles, the Survey promoted both the diversity of current three-dimensional expression and the achievements of living artists. It also encouraged dialogue and exchange between experts, and provided much needed visual stimulation and education for young and old. The invitation of significant resident artists not just from other states, but especially from overseas has considerably enhanced local knowledge and sophistication. But above all it is in its support of local talent and conviction that it is possible to achieve something fine, original and of lasting value here in our own community that the Survey makes its most enduring and important contribution.